I took apart me old RE2 radio to see what the internal storage looked like. 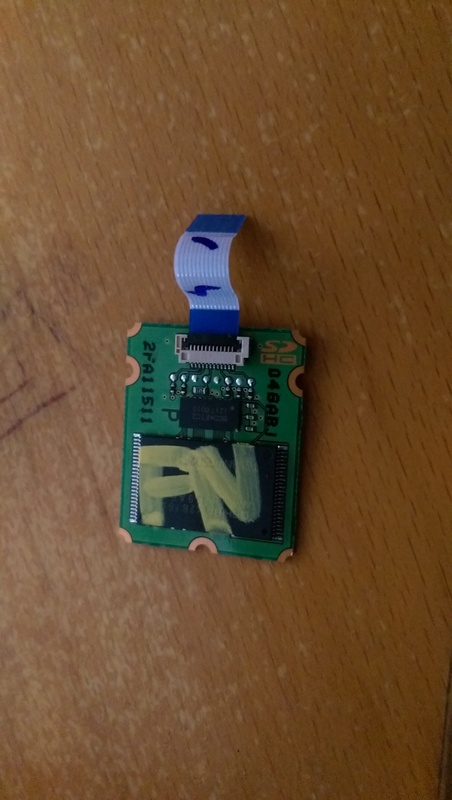 And its a IC on a board that uses a flex cable, so you would need to know the pin outs. I was expecting to see modified standard SD card in some type of holder, that made it a little more obvious. Last edited by Javelin3o4; 07-18-2016 at 03:29 PM. I have a 160gb iPod Classic in my Dart and use Winamp to manage all my purchased music. If I go into All Songs or w/e on the UConnect, i get the proper amount of tracks. However when I made a playlist on my PC, the UConnect caps it at 1000 songs, even though there are WAY more than that on it... Driving me insane. Sort them into folders. I have a bit over 4k songs on a 32GB SD card. They all show up on UConnect fine. Am I missing something here? Don't all your uConnects also sort your songs and everything alphabetically instead of by track number when you go into an album, or even a playlist for that matter? Doesn't that drive you insane? I know it does for me. Nah. I use MediaMonkey. It does all the work. I have them sorted by Genre > Artist > Album. I think it took me all of about 10 minutes to sort my 96GB library, and then about 30 minutes to figure out what I wanted on the drive and copy the folders. Again, sadly I don't see this as a viable option for me since I have 3 Apple i products on my desk currently, even though I'm more of a PC person when it comes to computing. I just feel that Apple has done pretty much everything right when it comes to their iPod's, and I use them in a total of 3 cars, and 2 different stereo's/docks. Seeing as the Dart is the ONLY one of my players that causes me frustration, I just have avoid the uConnect interface and use an aux jack, even though the uConnect claims iPod capabilities. To me their definition of iPod connectivity is unacceptable. I love that this thread is from 2014, here it is 2019 and I've got a brand new Jeep with the same issue! I even joined this forum just to reply with my thanks. Anyhow, i thought I'd contribute this tip for iTunes, to trim your folder count. You know all those "one hit wonders" you have, well they consume 2 folders each, one for the artist and one for the album title. Put them in a fake album called Singles, and set the "Album Artist" to "Various Artists". All those songs now live in a single folder! I went down from 1100 to 900 folders in an afternoon, and I'm happy again!